The Imo State governor, Owelle Rochas Okorocha has pledged to work harder for the development, peace and progress of all parts of the country. He said as a detribalized Nigerian, he would continue to promote the interest and peaceful co-existence of all tribes. Gov okorocha stated this while reacting to claims by APGA leader, chief Victor Umeh that he left the party to pursue an anti-Igbo agenda in the APC. 'I am a detribalized Nigerian who is determined to work in the interest of everyone irrespective of their tribes. APGA is essentially a seasonal party and cannot help Ndigbo to achieve national offices or attain leadership positions in these democratic dispensation. 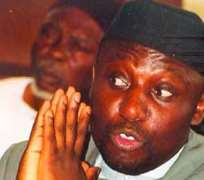 Governor Okorocha said he would not join issues with Chief Umeh who he said remains his brother and would be welcomed into APC if he so choose. He said that those who criticize him for joining APC have failed to take into account that no Igbo man was currently holding any of the six key positions in the administrative of the country. Governor Okorocha praised the south-east for their enthusiasm and support for the APC and promised that the party would be the vehicle for the rapid and sustained economic development of the region. Governor Okorocha who welcome the 22 State Chairmen and 5 National officers who decamped from APGA to APC, called on all other members of the party to join the progressive bandwagons for total eradication of poverty in the country.